Have you found an online vendor selling Clement 10-Year? C est le rhum qui m a fait comprendre que au final ce n était pas les rhums de type espagnol que je préférais. Agricole rum van Martinique die 10 jaar heeft gerijpt op eiken vasten. Ik proef vanille, kaneel, amandelen en hout. Droog en niet zoet. I tasted this side by side with the Clement 6 year and the Clement Homere. This came closer to the Homere in terms of quality and taste. In fact, I prefer this to the Homere. Tastes and smells of an agricole with oak, spice, almond, and cinnamon, with a slightly floral accent. It's a very nice agricole, though a bit dry for my taste. 42% ABV. A solid agricole, very dry and a good amount of oak. But there's just too much cherry on the nose, and it's bottled far too weak. Let's suppose someone blind folded you and told you that two snifters sat in front of you and you were asked to sip each one. Your choices were: two bourbons, two rums, or one of each. Let one snifter be this rhum agricole and the other one be an 8-12 year old Kentucky bourbon. Most of you would say that these are two bourbons. 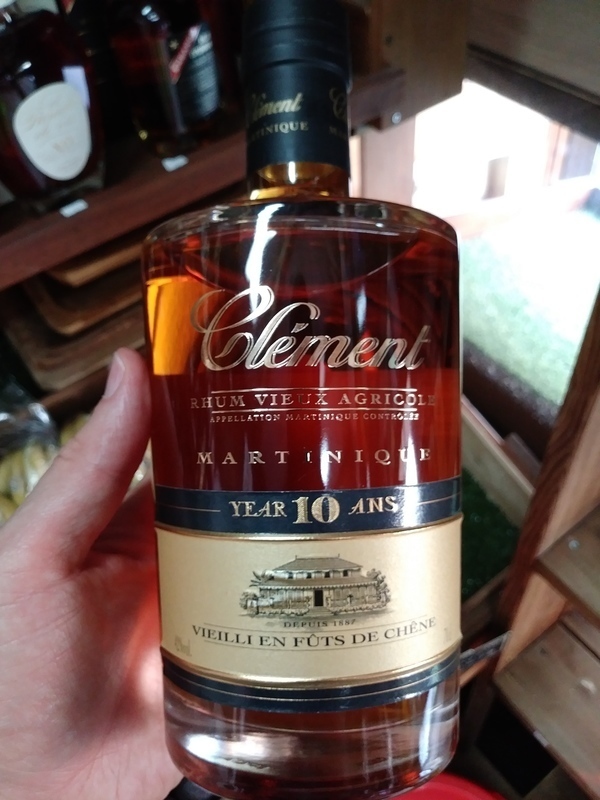 This 10 Year Clement is the most bourbon-like rum that I have ever tried. So, at this high price, why buy this rhum in the first place? One is better off with rhum agricoles of LESSER aging because of the "too long in the wood" factor really affecting agricole rhum much more than molasses based rums. Ice cubes tame this one down, but I won't waste my money on it again. Their 6 Year is much better. Their younger VSOP is even better yet. This is one of the few highly rated rums that have sunk down to this low level in my ratings. The others who have earned this distinction are Mount Gay XO and Flor de Cana 18. Buyer beware!!!! The nose is strong tea leaves, the flavor when kept long in mouth is a bit of fruity whisky, otherwise not my cup of "tea", haha. But add 3 if you are a fan of agricole. The aroma reveals rich buttery notes of grass, raw wood, spices and roasted fruit. The taste is dominated by notes of cinnamon, wood and vanilla, due to the maturity in oak barrels. The spicy flavors hereby harmonize well together with some hints of toffee. This rhum has a long-lasting and complex finish which reveals also smoky notes. A very good rhum. I give it a rating between 8 and 9. Rhum is to rum as rye is to bourbon. The 10 years age brings out notes of cherry, tobacco, oak and vanilla. It has an almost absinthe quality of a Sazarac. The grassyness on the finish reminds me of rye whiskey. But this is rhum that imparts a slight dryness that compliments the agricole funkyness . Complexity is obvious. Almost like cocktail neat. Just for fun I dropped a Luxardo Cherry and small amount of Luxardo cherry syrup into a pour. It was absolutely amazing. Still as a sipper I recommend chilled. The nose is lost but as it warms on your pallet, you will get waves of flavor. According the ratings this must have been a really tasty rum, but it is not. It is too dry for my taste and I dont like the "grassy" taste. As I like to call it. No fan of this Clement rum. Maybe the next one will be better. he kick's right in, so for at the end of the day on sofa after a long day of work, to get some energy perfect, just for bedtime, maybe not. If you love the taste of oak barrels, then this rum is for you. The oak barrel taste is the only flavor you get. No caramel, no molasses, nothing... just oak. Even when you mixe it with soda, you still can't get rid of the oak taste. This rum was probably aged far too long. Disappointing. Rhum très agréable. Offrez le pour faire plaisir à un proche. Add 3 points to the score if you like Rhum Agricole's. 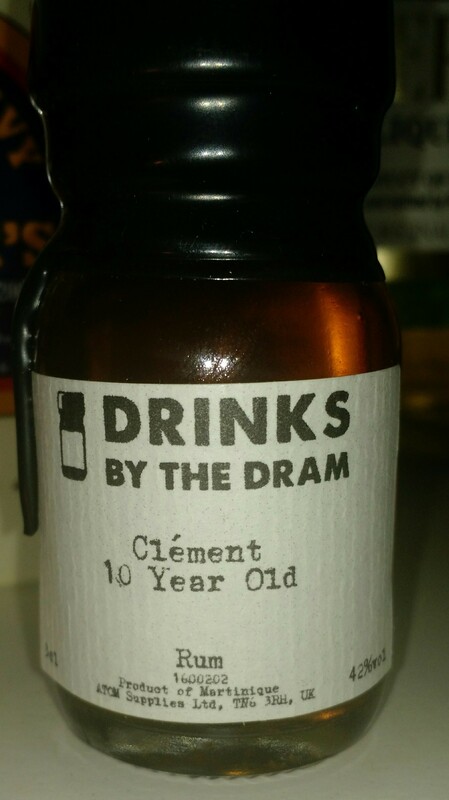 I don't fancy the Clement 10 year at all since it is way too dry for my taste. It is a very flavorful Rhum Agricole in general terms, but not my cup of tea. There is no burn at the end at all, but the flavor profile is quite a mixture of very large bunch of flavors. It's not bad at all, but deserves a score of 5, nothing more. Rum zoals rum moet zijn. Smaak blijft mooi rond voor een goede prijs. Il s'agit d'un assemblage de rhums de 10 ans d'âge. Design : étui cartonnée, belle bouteille standard de chez Clément. Le rhum a une couleur dorée. Nez : très parfumé, les odeurs de fruits secs et de boisé dominent. Bouche : attaque douce, fruitée puis dominante de notes torréfiées et de fruits secs. Le boisé est très (trop?) présent. Finale : Assez faible, petit arrière goût de réglisse, agréable. Ce rhum est léger, agréable mais trop de boisé et pas assez de punch. Le 6 ans m'a laissé une meilleure impression. Le boisée le tabac sont prédominants ! De l'amertume arrive ensuite (noix, pelure d'orange). Il ne laisse pas indifférent mais il faut aimer le rhum agricole ! Clement 10 Year is het resultaat van het vakkundig gebruiken van een mix van nieuwe en oude vaten tijdens het rijpingsproces, de oude rum van Clement komen met heerlijke karakteristieken van hout en kruiden zoals kaneel en zoete vanille. Een oude rum die het resultaat is van een uitzonderlijke blend van rum die minstens 10 jaar hebben gerijpt in 200 liter vaten van eikenhout. Zalige aroma's openen met intense tonen van kruiden en gedroogd fruit. Rumkenners zullen de lengte van het palet en de hints van amandelen kunnen waarderen, hints die boven een aangename toon van rijk eikenhout liggen. If you like rhum agricole, you will like this one. If you don't like rhum agricole, maybe you will like it. I personally don't love rhum agricole, but this one I drink. I have had the unique experience of living in the Caribbean and sampling many different rums, and this is one of the best. A lot of vanilla on the front and the back, and I was shocked when our friend mixed it with Coke, but it makes a fantastic Cuba Libre!